Located in the otherwise unknown town of Hangal, the Tarakeshwara temple is truly a fine example of the architectural marvel of our medieval times. The temple which is dedicated to the Hindu god Lord Shiva is assigned to the mid-12th century A.D. The name of the temple is derived from the Tarakeshwara form of Lord Shiva. Even though the credit of construction of this temple goes to the Kadambas, it was the Kalyani Chalukyas that made significant changes to make it into the form we see today. The Tarakeshwara temple is a listed monument of the archeological survey of India. To begin with, the town of Hangal is believed to be the Viratnagar in the epic Mahabharat. Viratnagar is the place where the Pandavas took shelter in disguise during their Ajnatavas (Secluded living). The earliest known dynasty to have ruled the town of Hangal was Kadamba. The Tarakeshwara temple was the most significant contribution of the Kadamba to the history of the town. With Jainism gaining massive appeal in the region in the 12th century, this temple became the bastion for the Shaivites (the section of believers who worshipped Lord Shiva). However, the town and the temple came into prominence during the rule of KalyanaChalukyas who were the most powerful in the Deccan during their period. KalyanaChalukyas were famous for their typical style of temples. 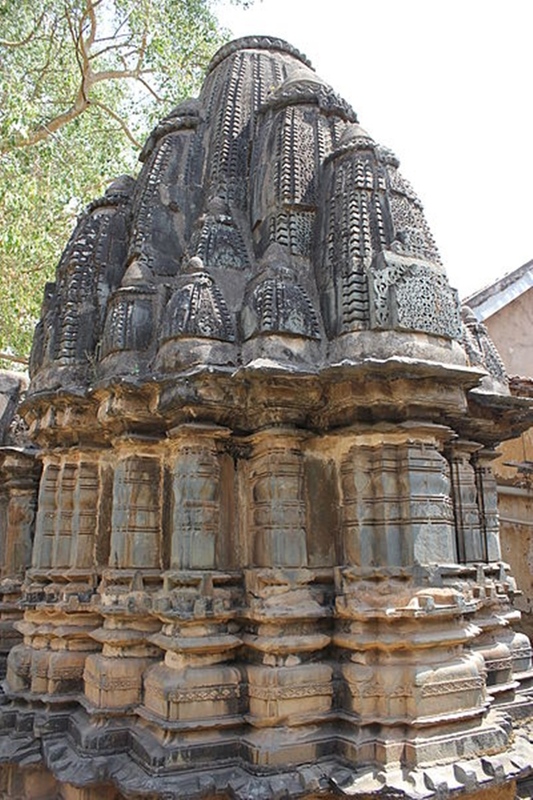 The Chalukyas made massive architectural innovations and additions to the temple, stamping the impression of the popular Western Chalukya art to the temple. A fine example of the Chalukya style of architecture, this temple is built with grey- green chloritic schist and has intrinsically carved walls and ceilings. The major attraction of the temple is in the main hall which has a large domical ceiling in the form of a lotus. The ceiling rise in concentric circles towards the centre, making patterns of the folds, and then drops down again as it reaches the apex. This gives the appearance of a bloomed lotus. The gathering hall has 8 supporting pillars arranged in octagonal shape and has carvings of various gods. The images on the walls depict scenes from the epic Ramayana. It is interesting to note that the temple which is most prominently known for its architectural beauty also has a subtle element of engineering excellence associated with it. For instance, the pillars of the main hall are lathe turned. The bell-shaped sections on the pillars are also work of lathe. Remember the temple was built in the 12th century A.D and lathe was definitely an advanced technology back then! The decorations on the pillars include very detailed carvings of elephants and diamond-shaped motifs. Adjacent to the main hall is another hall which goes by the name Nandi Pavilion. This 12-pillared hall is dedicated to Nandi, the bull ridden by Lord Shiva. The Nandi pavilion also has a leaning balcony setting. Both these halls have stepped pyramidal outer roof. In front of the main hall one will also come across the memorial stones with religious and military scenes. The outer walls of the temple are designed with Shikaras (a type of boat found in the Dal Lake) in the Dravidian and Nagara style. The Ganesha temple located to the north- east of the Tarakeshwara temple has been built in the Nagara style and is definitely worth a visit. The Tarakeshwara temple is situated in the Hangal town of Haveri district of Karnataka. It is located at the left bank of the River Dharma and is about 75 kms from the Hubli – Dharwad . The town is around 370 kms from Bengaluru. The town of Hangal does not have an airport of its own. The nearest airport is in Hubli. If you wish to travel by air, you may have to fly to Hubli and then catch a bus or private cab to Hangal. Hangal has well-connected bus network to the other districts of Karnataka. The state bus depot of Hangal is very near to the Tarakeshwara temple. One may also opt for the cab service available from the major cities of Karnataka such as Bangalore and Mysore. The nearest railway station to the temple is the Haveri railway station which is approximately 40 kms from the temple. Once you reach the railway station, there are plenty of options for road transport to take you to Hangal. The rarity of this temple lies in the fact that it has elements of different forms of architecture, mixed into a magnificent creation. One can only stand in awe at the beautifully balanced collaboration of various styles of architecture teaching us volumes of our glorious medieval history.